Any way you look at it, a leak is a bad situation. Even a small leak can end up costing a good deal of hard earned money to resolve. Repairmen are expensive, and after you factor in labor and supplies you’ve gone and broken the bank. Or you can endeavor to remedy a repair yourself with putty or rubber. But it seems anything you try, nothing will stop that leak. Don’t you wish there was a better, more cost effective method to correct the problem? 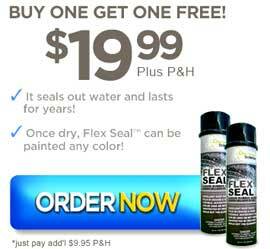 How is Flex Seal Different Than Other Sealants? Flex Seal is a durable liquid rubber conveniently housed in a spray aerosol can. The Flex Seal spray nozzle delivers a thick, accurate stream of product directly to the desired location sealing the crack or leak as intended without making a mess. Flex Seal leaves the can strong and thick, but remains flexible enough to mold into any shape desire. This makes Flex Sea perfect for repairs involving roofs, pipes, or gutters. The liquid rubber adhesive is sufficiently durable to make your repair last for years. Flex Seal doesn’t weaken or crack in the winter, nor does it melt or sag during the hot summer months. Flex Seal is a waterproof rubber that fills in leaks entirely. When drying, Flex Seal will expand to completely fill and conform to the area you are repairing. After 24 hours of drying time you can even paint Flex Seal any color you choose. Flex Seal earned its title of “handyman in a can” because of its broad range of uses. Its best use is filling cracks and leaks in anything and everything imaginable from boats to ceilings. Another great feature is Flex Seal has an amazing ability to halt vibrations. It can also be used as a source of insulation, for both temperature and noise. Imagine the money you will save on utility bills by simply fixing the cracks around your doors and windows. One can of Flex Seal can mend and protect up to eight square feet of surface depending on the thickness you choose for your application. For less than $20, that’s a great deal of work that could be accomplished in comparison to what a professional would charge. And right now the makers of Flex Seal are offering a BUY ONE GET ONE FREE offer. Flex Seal™ also comes with a 100% satisfaction guarantee, so what do you have to lose?